Custom designed and created sculpted area rugs begin with color, style and precise measurements. You, the Designer, may already have something in mind and all Gino will need to do is take the measurements. This is entirely up to you. If you&apos;d like to collaborate, Gino is excellent at designing the rugs to match the room(s) in question. He can look over the rooms(s) in question, noting detail in the furniture's woodwork, the architect's wall and window design, and your overall design concept. Is the estate in question contemporary or traditional? Is the home's influence Asian or Middle Eastern? Is the attributes telling him the abode is Mediterrenean or Western in nature? All of these factors go into account when Master Gino begins to visualize the custom area rug's creation that will become your own..fresh and original every time. He may incorporate elements from the intricately carved leg of a chair or table, or the colors of the silken draperies or patterns from the sofa's fabrics: into the final area rug's border or field. Measurements are critical in the artist's repertoire. 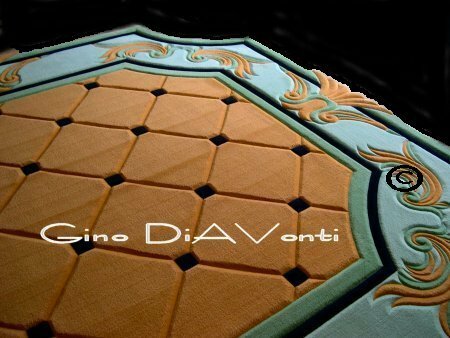 For this reason Mr. DiAVonti will insist that the room(s) in question are already furnished before he can begin his assessment of a custom area rug design. As an example, Gino will take a measurement from the coffee table's leg to the edge of the couch or loveseat/chair (usually 18") to create critical size and allow any patterns that may end up present in the custom area rug's final rendering. This will allow the design to show in full force and the complexity that Master Gino intended. 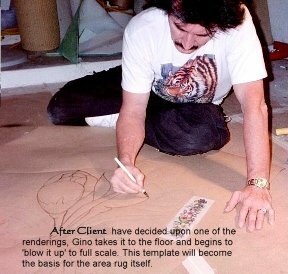 All of Gino's drawings are created perfectly to scale, and in at least two sets of colors...to allow you as the owner, to make choices as to what you will see when the custom area rugs are completed. 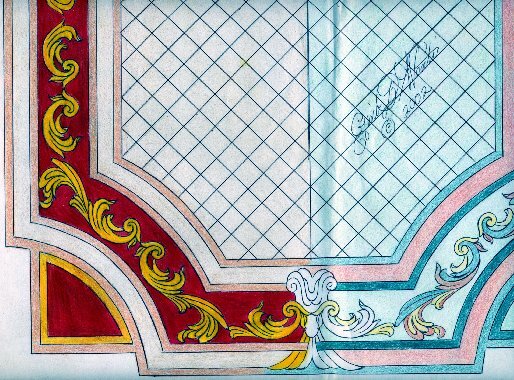 Only after the measurements are taken, can Gino begin to draw and color up the renderings, which are the basis of the custom area rugs in question. The drawings take anywhere from 1 to 3 weeks, depending upon the complexity and amount of area rugs that are desired by you. The renderings will show more than one color scheme, so you will have a choice as to what will work best for you and your home. After you have chosen a design and color scheme and signed off on the approved rug(s), Gino will begin to upscale the drawings to the actual area rugs themselves. The area rugs themselves vary in time of completion. This depends largely on the detail and size/amount of rugs desired by you. Most clients order more than one rug. This allows for maximum use of the carpet, which is sold only in widths no smaller than 12 feet. To insure that you get your monie's worth, what would have become scrap in most cases can instead be used as other matching rugs for the same or adjoining rooms of the estate. On an average, Gino makes three rugs per client when rugs are ordered. 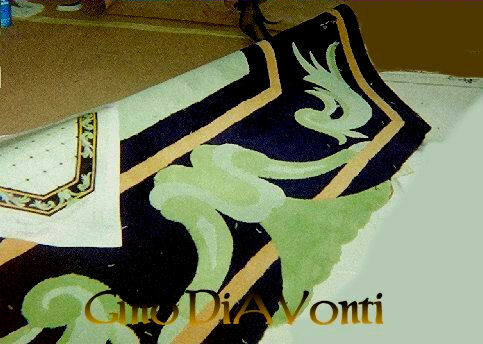 When all the custom area rugs have been created and carved, Gino delivers them himself if local, and if not, they are easily shipped worldwide through FedEx. The drawings are returned to you (Gino needs the drawing back after you approve, to use as basis for the full scale rugs) and you or your designer can easily install them as the artist intended simply by referring back to the drawings themselves. Contact Gino&apos;s Representative Nichole today for more detailed information. Phone 239.895.7681 Call between 10:00 am and 6:00 pm please. Here&apos;s more information on how the Custom Area Rugs are made. Here&apos;s more information on how the Custom Area Rugs are priced Out. © Gino DiAVonti ∼ All works contained herein are under full ownership of the Artist. No copies or photos are to be distributed without written consent from the Artist.